Posted on August 14, 2017 | Comments Off on On my way! Today I took the GR7, Introduction to Global Remuneration test through World At Work at Pearson Vue. I was really nervous for many reasons – I hadn’t studied as much as I had wanted to, the text was full of detailed information that was really confusing in the details, and other stuff. Part of the other stuff was hanging over my head the cost of this course/test on my credit card since the work reimbursement policy changed to only reimburse after a completed/passed course. Before it was half up front, half when passed. I suppose it is good for both parties, as the company doesn’t have to pay for longer and it doesn’t have to chase after funds if the course isn’t passed. That and I was in a car accident over the weekend. It both stole study time as well as made it very hard for me to concentrate while taking the test (cognitive) and the pain was very … painful and distracting. Luckily, I managed to pass. It would have been nice to have a higher score, but I’ll take what I can get. Onwards and upwards! Comments Off on On my way! I was thrilled that my manager urged me to take the final two courses that are the difference between the CCP and GRP. I’m working my way through the Overview course, knowing that the financial one would be harder. I didn’t realize how complex this overview would be. I appreciate that the course has been recently updated. I’m thrilled that there are many things about various countries or regions I already knew. But there is so much, that I feel overwhelmed. I worry about how detailed the test will be. Based on other courses I guess the test will be 75-90 questions. I know this will be worth it. Considering that compensation is becoming a standard module to Human Capital Management (HCM) systems, and those are growing to be global. There are enough companies out there using HCMs that have employees world wide, that they need to have flexibility to handle taxation and addresses that oddly is not taken into the design process. I’m excited by the carrot my manager offered me, that I will be at the leading edge of this compensation module for my company. In the past six months I’ve had three managers. The one I was hired by resigned, moving the entire team to his boss. After a while, that guy was told he couldn’t manage folk two-three levels below him, so we got redistributed to new-to-us managers. Before my initial boss left, we did the annual review process (four months early.) The way he and his boss both handled my engagement, successes, and professional growth both externally and with internal products was underwhelming. To the point both discouraged me from seeking additional professional development outside of our company, asking me to focus on the product we support. Ok, that is great. Except that I’ve been mentoring and training others on our internal product for over a year. I am constantly sending suggestions or writing up how to documents both for internal and external use, and acting as a support to peers on said product. I’ve clearly demonstrated an expertise on it. I was sorely disappointed that with my 13 years experience in the field, 9 years experience in the industry of HCMs, having a degree and multiple certifications that I wasn’t even given the target merit increase this year. That I wasn’t brought up to market rate for someone with 1 year experience in the field. Never mind that I’ve spoken with my local peers and all the women are $10k+ underpaid compared to the men with often less experience and no certs or degrees in the field. I had asked my former boss’s boss if the gender inequality was reviewed. He hadn’t even thought of it, let alone looked into it. He knows I know Compensation. Just the ease I displayed in using terms and concepts, never mind those wonderful three letters after my name. My current manager is a breath of fresh air. SHE encourages me to seek out professional development both on our product and externally. She recognizes my expertise and all I have done to help others. She comes to me to double check others work or to help figure out very difficult things. I was exceedingly thrilled when in one conversation I flat out asked her, “It sounds like you are grooming me for a promotion. Is this your intent?” She confirmed it was. Woohoo! I find it very interesting how different the management styles and how they view me and what I have to offer are between the men and women in the business unit. I’m not prepared to say it is the whole company, because it is clear looking at the C suite that isn’t the case. Last year I found myself in the UK for the first time, luckily I had a friend who had lived there previously with me to navigate both locations and social norms. 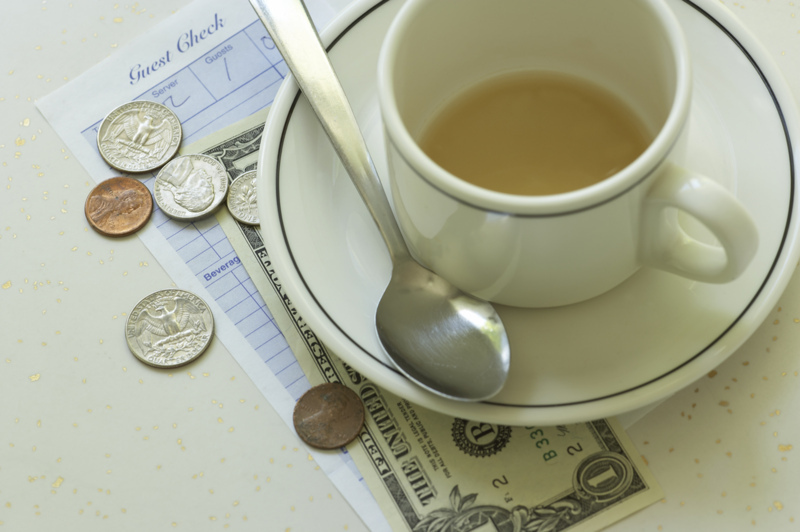 One of the biggest cultural norms I had trouble with was the concept of was tipping. I tipped our tour guides, hotel maids, when I placed an order at the pub, etc – until she told me otherwise. The holiday season is nearly upon us, and in the US the talk about how to tip various people in our lives is going to become omnipresent. There are articles that suggestion holiday tips for your hair stylist, newspaper delivery person, etc. This discussion also highlights the controversy over whether or not and how much one should tip, specifically when eating out. Note: In the case where a state minimum wage is higher than the federal minimum wage, the higher is what the employer must pay. What I have not heard in any discussion of the topic, is that if the tips are not sufficient to meet the minimum wage (be it federal or state) then the employer must make up the difference. For example, in Alabama (that uses the federal minimum wage) if a wait person works for 5 hours on a slow shift so they took in only $5 of tips, they don’t bring home a gross of $15.65 for the day, they bring home a gross of $36.25 (=7.25*5). Why? (5*2.13)+5 = 15.65; 15.65/3 = 5.22/hour which is below minimum wage. Thus the employer must make up the difference between the $5.22 and $7.25 per hour. Keep in mind, this is over a weekly basis, not daily as the example implies. If one is familiar with commission pay structure, where there is a draw forget that as it applies to tipped employees. The amount the employer pays between earned minimum wage and federal/state minimum wage is never paid back to the employer from the employee. So, back to the original discussion. Should you tip? Yes. Do you need to so that they can earn more than $2.13/hour – that is up to you. It is best to bring up any issues as they happen and directly, instead of being passive aggressive with tipping. But being passive aggressive won’t impact their earnings and minimum wage. Personally, I don’t do holiday tips. I tip well at the point of service. I tip 20 or more percent depending on service, and rarely tip below that.